I learned to knit and crochet when I was eight years old and it quickly became something that I loved to do. I moved to Kalamazoo when in my twenties and learned to weave at the Kalamazoo Institute of Art. Soon I had my own equipment and I continued to take classes regionally as a member of local and state guilds. In 1999 I became the head of the fiber department at the KIA where I continue to teach weaving and dyeing classes. In 2007, I was accepted into Signature. 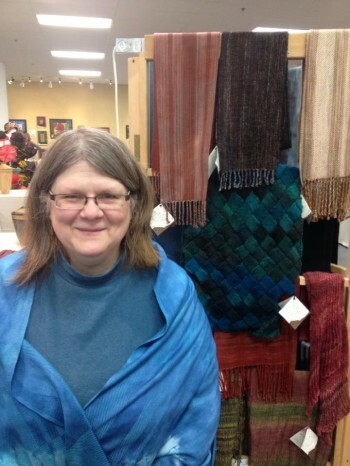 in 2013 I opened Kalamazoo Fiber and Dye Studio with my business partner Helen Duffy. We offer dye classes and studio space for local weavers and dyers. I became interested in adding color to my work in 2002. I began travelling to Penland School of Craft to study. In 2007 I opened my first dye studio which morphed into Kalamazoo Fiber and Dye.